WAVE EQUATION Electronic Music series incites an entertaining rendez-vous of electronic-based musicians exploring live performance software and analog synthesis. 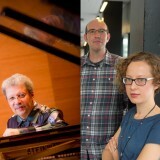 Audiences are invited to ask the trio questions and discuss their work and legacy. 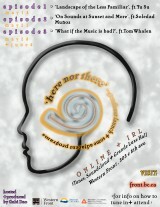 Audiences are encouraged to engage in conversations with the composers and performers. 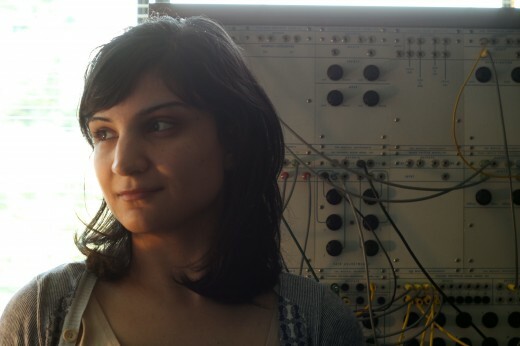 Join composer Sarah Davachi for a workshop and conversation covering her compositional framework, ideologies, and dedication to the historic importance of analog synthesizers. Known for combining noisy textures and conceptual tactics with rhythmically driven electronic pop music, M. C. Schmidt and Drew Daniel have extracted samples from the strangest of sources including laser eye surgery and a five gallon bucket of oatmeal! Having shared the stage with Bjork, Terry Riley, Zeena Parkins, and The Kronos Quartet, these Baltimore-based heavy weights have a lot to share with keen Vancouverites. Democratic, irreverent and traditionally experimental, Alvin Curran travels in a computerized covered wagon between the Golden Gate and the Tiber River, and makes music for every occasion with any sounding phenomena — a volatile mix of lyricism and chaos, structure and indeterminacy, fog horns, fiddles and fiddle heads. He is dedicated to the restoration of dignity to the profession of making non-commercial music as part of a personal search for future social, political and spiritual forms. Curran’s music-making embraces all the contradictions (composed/improvised, tonal/atonal, maximal/minimal…) in a serene dialectical encounter. His more than 200 works feature taped/sampled natural sounds, piano, synthesizers, computers, violin, percussion, shofar, ship horns, accordion and chorus. Whether in the intimate form of his well-known solo performances, or pure chamber music, experimental radio works or large-scale site-specific sound environments and installations, all forge a very personal language from all the languages through dedicated research and recombinant invention. Frederic Rzewski is an American born composer, now resident in Belgium, of mostly chamber, vocal and piano works that have been performed throughout the world; he is also active as a pianist. Prof. Rzewski studied music privately with Charles Mackey in Springfield, Massachusetts as a child and studied composition with Walter Piston and Roger Sessions, counterpoint with Randall Thompson and orchestration with Claudio Spies at Harvard University from 1954–58. He studied composition withMilton Babbitt and the music of Richard Wagner with Oliver Strunk at Princeton University from 1958–60, where he also studied literature and philosophy from Greece. In addition, he studied composition privately with Luigi Dallapiccola in Rome in 1960. 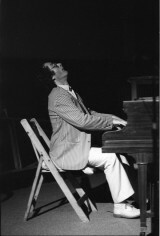 As a pianist, he frequently performed with the flautist Severino Gazzelloni in the 1960s. He then co-founded with Alvin Curran and Richard Teitelbaum the improvisational and live electronic ensemble Musica Elettronica Viva in Rome in 1966 and performed with it from 1966–71. Since then, he has been active as a pianist, primarily in performances of his own pieces and music by other contemporary composers. He taught at the Conservatoire royal de musique in Liège from 1977–2003, where he was Professeur de Composition from 1983–2003. He has given lectures in Germany, the Netherlands and the USA. Composer and electronic musician Richard Teitelbaum was born in NYC in 1939. After graduating from Haverford College, he went on to get a Master of Music degree from Yale in 1964. Teitelbaum studied with composers Luigi Nono and Goffredo Petrassi in Italy on a Fullbright scholarship, after which he brought the first Moog synthesizer to Europe. Teitelbaum performed hundreds of concerts with it, and co-founded the pioneering live electronic music group Musica Elettronica Viva with Frederic Rzewski and Alvin Curran in Rome, 1966. An opera of his entitled Golem was performed at the Ars Electronica Festival in Linz, Austria (1991), and Teitelbaum himself has performed throughout the U.S., Japan and Europe. His music is heard on Cantaur, Hat Hut, Tzadik, and other labels. Besides making music and working with interactive computer systems, Teitelbaum has taught electronic music and composition at New York’s Vassar College, and Bard College where he has also been Director of the Electronic Music Studio. Sarah Davachi holds a bachelor’s degree in philosophy from the University of Calgary, and a master’s degree in electronic music and recording media from Mills College in Oakland, California. As a composer of electronic and electroacoustic music, Davachi is engaged in practices of analog synthesis, psychoacoustic manipulations, multi-channel sound diffusion, and studio composition. Davachi’s compositional projects are primarily concerned with disclosing the antiquated instruments and forgotten sonics of a bygone era in analog synthesis, with concurrent treatment of acoustic sources – particularly organs, strings, and woodwinds – often involving de-familiarization through processing. Her work considers the experience of enveloped sonic dwelling, utilizing extended durations, gradual transformations in texture, and simple harmonic structures that emphasize variations in overtone complexity and natural phasing patterns. Kiran Bhumber is a musician, new media artist and educator based in Vancouver. Her work examines human emotions and memory through the physical nature of sound. By constructing interactive installations and performance systems, Kiran allows performers and audiences to experience these themes through motion and haptic sensing systems. She has performed and presented her works at various festivals and conferences including The New Interfaces for Musical Expression Conference (Australia), The International Symposium on Electronic Art (Vancouver), The Toronto International Electroacoustic Festival, The Vancouver International Jazz Festival and The International Conference on Live Coding. She is currently completing an MA in Media Arts as a graduate student research assistant at the University of Michigan. Kiran is advancing her research on creating digital musical instruments (DMI) in addition to interactive performance systems and electroacoustic composition. Kiran holds a Bachelor of Music degree (2014) from the University of British Columbia. Currently based in Baltimore, MATMOS formed in San Francisco in the mid 1990s, and self-released their debut album in 1997. Marrying the conceptual tactics and noisy textures of object-based musique concrete to a rhythmic matrix rooted in electronic pop music, the two quickly became known for their highly unusual sound sources: amplified crayfish nerve tissue, the pages of bibles turning, water hitting copper plates, liposuction surgery, cameras and VCRs, chin implant surgery, contact microphones on human hair, rat cages, tanks of helium, a cow uterus, human skulls, snails, cigarettes, cards shuffling, laser eye surgery, whoopee cushions, balloons, latex fetish clothing, rhinestones, Polish trains, insects, life support systems, inflatable blankets, rock salt, solid gold coins, the sound of a frozen stream thawing in the sun, a five gallon bucket of oatmeal. These raw materials are manipulated into surprisingly accessible forms, and often supplemented by traditional musical instruments played by them and their large circle of friends and collaborators. The result is a model of electronic composition as a relational network that connects sources and outcomes together; information about the process of creation activates the listening experience, providing the listener with entry points into sometimes densely allusive, baroque recordings. 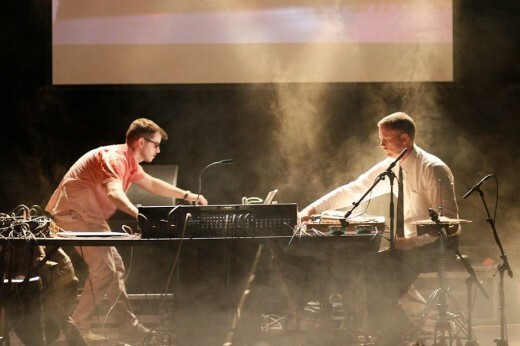 Since their debut, Matmos have released over eight albums, including: Quasi-Objects (1998) , The West (1998), A Chance to Cut Is A Chance to Cure (2001), The Civil War (2003) and The Rose Has Teeth in the Mouth of A Beast(2006) and Supreme Balloon (2008). In 2001 they were asked to collaborate with the Icelandic singer Bjork on her “Vespertine” album, and subsequently embarked on two world tours as part of her band. In addition to musical collaborations with Antony, So Percussion, Terry Riley, The Kronos Quartet, David Tibet, the Rachel’s, Lesser, Wobbly, Zeena Parkins, and the Princeton Laptop Orchestra, Matmos have also collaborated with a wide range of artists across disciplines, from the visual artist Daria Martin (on the soundtrack to her film “Minotaur”) to the playwright Young Jean Lee (for her play “The Appeal”) to Berlin-based choreographer Ayman Harper. Most recently, they have been part of the ensemble for the Robert Wilson production “The Life and Death of Marina Abramovic”, featuring Marina Abramovic, Antony and Willem Dafoe. Their most recent album, The Marriage of True Minds, was released in 2013 by Thrill Jockey Records. 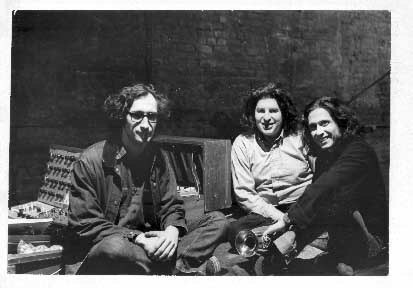 Musica Elettronica Viva circa late ’60′s (L to R) Frederic Rzewski, Richard Teitelbaum, Alvin Curran. Musica Elletronica Viva (L to R) Richard Teitelbaum, Frederic Rzewski, and Alvin Curran. Kiran Bhumber wears her Reactive Body Suit developed with Bob Pritchard. Sarah Davachi captured by Richard Smith. Matmos: Drew Daniel (L) and MC Schmidt (R) perform. 88 Tuned Bongos Piano Series cont.